In recent years, the drilling industry has demanded a safer workplace. 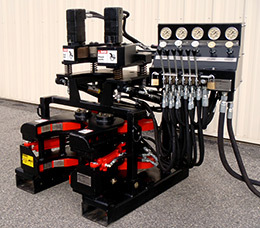 BLACKDOG™ INDUSTRIES has responded to this demand with its Hydraulic Breakout Wrench: a safer, hands-free way to breakout drill tooling while increasing productivity. 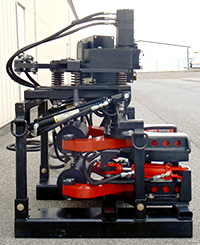 Our tools have been used on sonic, water well, oil and gas rigs as well as on workover rigs in northern Alberta. 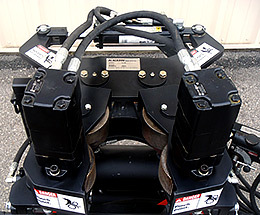 The Hydraulic Breakout Wrench (BOW) by BLACKDOG™ INDUSTRIES is an essential tool for success in today's competitive drilling market. The BOW eliminates the need for using tongs or hand held pipe wrenches and minimizes the time spent breaking joints. 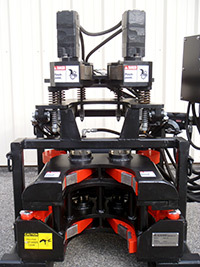 The makeup and breakdown of drill tooling is safer and more productive with the BOW. 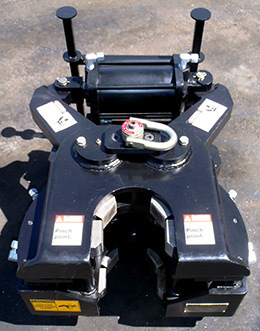 The BOW comes in a range of sizes and capabilities to suit any industry’s requirements. Please contact us for more information. 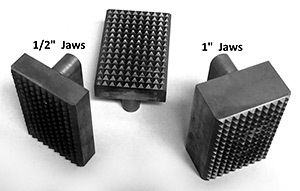 We often do custom modifications to our wrenches to adapt them for a client’s specific needs. 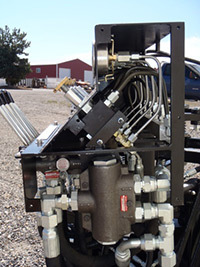 BLACKDOG™ INDUSTRIES’s optional Pipe Spinner increases productivity while maintaining a hands-free operation. 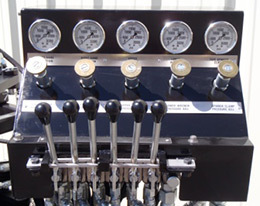 Pipe Range: 2" - 7"
BLACKDOG™ INDUSTRIES’s Control Panel, once supplied with the necessary hydraulics, facilitates operation of the BOW and Pipe Spinner. 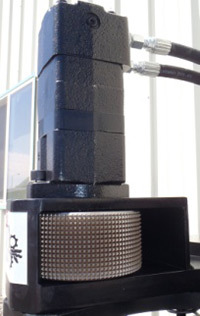 BLACKDOG™ INDUSTRIES has designed this unit for use on oil field workover rigs. 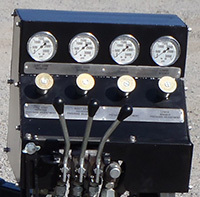 It combines the BOW with the Pipe Spinner and Control Panel. 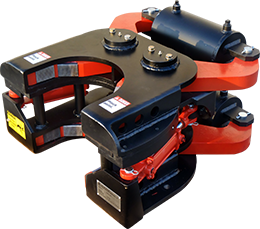 All components are mounted on a stand that can be lifted by a forklift or a winch line. 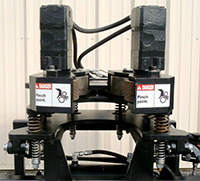 The Control Panel allows the operator to control the rotational torque in either direction as well as the clamping pressure of the jaws. The Pipe Spinner scopes back out of operating range when not in use to leave the BOW open for larger diameter tools.